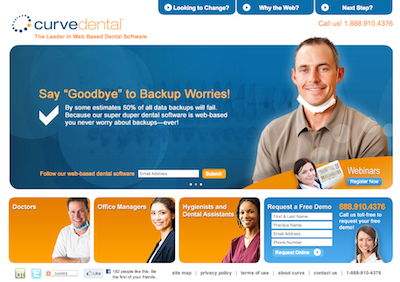 Curve Dental is the leading web-based software company serving practice management and medical records software and services to the Dental industry. Curve Dental addresses most all the needs of modern dental offices including patient communication, billing, claims processing, scheduling, reporting, clinical & periodontal charting, medical records and notes, digital radiography and imaging, patient education, and related services. All an office needs is a username/password and they have access to the industry’s leading browser-based dental technology. and proven at AdvancedMD Software and are being adapted to the dental specialty. This differentiation and proven foundation will permit faster scale, greater margins and happier customers than the legacy products can provide.